While diamonds may well be a girl's best friend, there's a lot to be said for low-cost alternatives. And, if you're a little crafty, you'll find that you can make some stunning handmade earrings using low and no cost supplies and a few basic craft skills. Earrings make great gifts, make a few pairs and keep some to give friends as gifts. 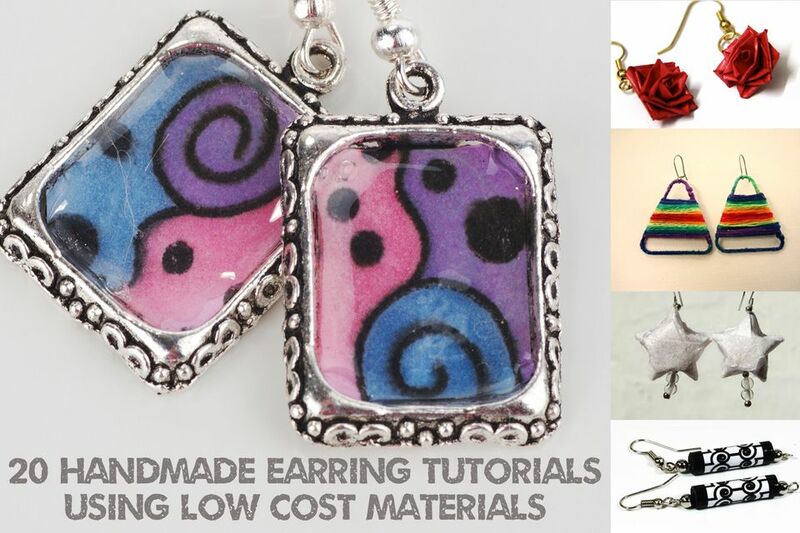 In this roundup of earrings made using low and no cost items, you'll be surprised at what you can make using just a few basic supplies. In each project besides the supplies you require to make the decorative earring component, you'll also need a pair of ear wires. You will find these in your local craft store as well as extensively online. Who would believe that these pretty rose earrings started life as thin strips of paper? Learn how to make your own with this detailed tutorial. Stunning copper earrings needn't be difficult to make, find out how to make your own and apply a patina to give depth to the copper finish using the tutorial below. When it comes to making earrings, it doesn't come a lot cheaper than using paper beads - however, the end results belie the humble beginnings. If you have some lace trimming to hand, or a lace insert in a garment or home accessory that you can upcycle, then these super-attractive earrings are both low cost and simple to make. A winning combination! This photo tutorial shows us how to create stunning knitted earrings from leather cord. If you love hot glue projects then you are going to go wild for this hot glue earring tutorial. These amazing earrings are made from drops of hot glue. This project costs just pennies to make, however the finished earrings look a million dollars! Paper beads are fun to make and are a great low-cost way to make jewelry. Check out the tutorial to learn how to make paper bead earrings. Create elegant stud earrings by covering buttons with a tiny piece of lace. Make these earrings from scraps of fabric. This is a nifty way to create earrings that complement an outfit. This project is so simple to do you could quickly create earrings to give as gifts. This is another who-would-believe-what-these-are-made-from projects. At the heart of these earrings is a simple 'unfolded' paper clip. Amazing results are achieved by wrapping yarn or thread around the unfolded paper clip to make attractive drops for earrings. Make these earrings using a few scraps of leather. They are going to be lightweight and comfortable to wear, as well as being quick to make. This is a great project to get started making bead jewelry. Learn how to create these pretty earrings using this detailed photo tutorial.